Good morning lovelies! 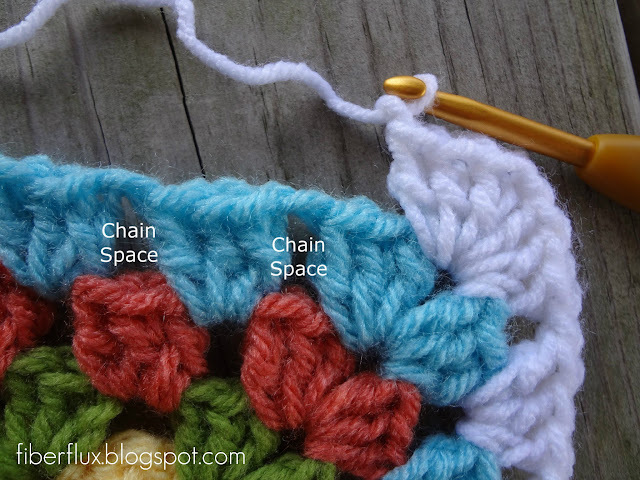 Several people have asked me about crocheting into the chain space (versus the stitch), so I thought this might be helpful. Often patterns will tell you to crochet into the chain space. Instead of working into the stitch, or loops created by the previous row's stitches, the chain space is the decorative "hole" or space. The photos above and below show the completed stitch within the chain space. Happy crocheting! Click here for a Granny Square photo tutorial too! Great point and very helpful, thanks! You're welcome! Several people had asked, and I thought it might help. Wonderful tutorial :-) Thanks! I much prefer crocheting in the chain spaces, especially with bulky yarn. Thanks for posting. Do you think you can show the chain space in a sample for your Pinot Noir Infinity Scarf? I couldn't find it and my "V" were off.